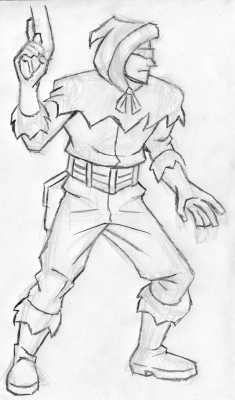 Bizarro (2013): I tried to draw a distorted version of the Superman edits I made from Capcom's Magneto sprites long ago. Braniac (2013): The robotic Braniac will always be my favorite version of the character so that's what I started with. This was drawn on paper before I sprited it. Zod (2013): Drawn on paper before sprited, but I had him in a slightly different pose. Harley Quinn (2013): Sprite-sketched by on Wacom digital tablet first. I'd done this before the 2013 Comic Book updates on ScrollBoss and planned to keep it hidden for another project, but making a Poison Ivy sprite made me want to show this one anyway. Poison Ivy (2013) Drawn by tablet on one of the 2013 Comic Book update nights on ScrollBoss. The first standing sprite pose is based on the cover of Batman 181, Ivy's first appearance, but the outfit is her first from Batman: the Animated Series. The Penguin (2014) Drawn on the same sheet of paper as Brainiac, but I didn't sprite him until early 2014. 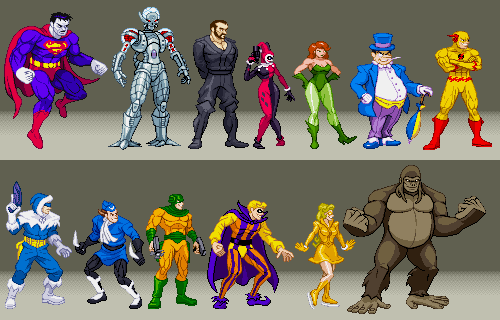 Reverse-Flash, C.Cold, C.Boomerang, Mirror Master, Trickster, Golden Glider, Grodd (2015) These rogues were sprited for Flash week in Jan. 2015, though I had an unfinished Grodd sprite for a while. Reverse-Flash's sprites come from the Flash sprites I made in this same week.